Keith Billington trained as a Registered Nurse in Britain and later studied Public Health Nursing at Dalhousie University, Halifax, N.S. He and his wife Muriel, an English trained midwife, immigrated to Canada, and lived in Edmonton, Alberta, for a year, working at the Charles Camsell Hospital where they obtained Canadian Nursing registration, then they were sent to work at the Fort McPherson Nursing Station in the MacKenzie Delta. They had two children in the north and a third was born later in British Columbia. Keith continued to work with, and for First Nations people and he and his wife now live in Prince George, B.C. where Keith writes articles on their outdoor adventures. PLACE OF BIRTH: North Wales, U.K. Cold Land, Warm Hearts: More Memories of an Arctic Medical Outpost. (Harbour, 2010). 1-55017-534-3 : $29.95. House Calls By Dogsled: Six Years in an Arctic Medical Outpost. (Harbour, 2008). Along the lines of Robin Ridington, Keith Billington has pursued a similar passion for First Nations ethnography by spending many years with various tribes in the north, first as a nurse and later as a band manager for the Sekani Band in Fort Ware. 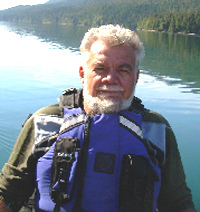 Billington's third book about his experiences, Tse-loh-ne (The People at the End of the Rocks): Journey Down the Davie Trail (Caitlin $22.95), describes a 25-day, 460-kilometre traditional Sekani trek along the Aatse Davie Trail using pack dogs. They brought little food, relying instead on what they could hunt or gather. The hike from Lower Post to Fort Ware includes grizzlies, cold, starvation, stick gambling and injury. The nomadic Sekani live approximately 1,600 kilometres north of Prince George in the Rocky Mountain Trench.